While everyone else is oohing and aahing over cold, starry nights and snowy days, if you own a horse you know that winter can be a challenging time of year. Your horse gets cold, things get wet and there’s the inevitable mud. To help you this winter, we’ve put together a list of six items (think of it as a Christmas gift list for your barn!) that can help make this winter a little less troublesome. 1. STABLE-ITY GRIDS: In the cold or snow, I still find my horses prefer to be outside most of the time. Many stables have paddocks off the stalls or sacrifice turn- out areas where your horse can get out and move around, seen and be seen. This is great for both their mental and physical condition. Unfortunately, paddocks can easily turn to mud and lost shoes and hoof disease like “scratches” can result. Stable-ity Grids are a permanent solution for mud management. The system interlocks and is placed over a level base of rock, then backfilled with coarse or angular sand, bluestone, etc. It provides excellent drainage and is maintenance free. Also great in high-traffic areas such as barn entry-ways, in run-in sheds or around water troughs. 2. DUTCH DOORS: Horses are highly curious and sociable animals. Often winter weather means less turnout time with their buddies. Installing Dutch doors on stall fronts allows your horse to get plenty of light and fresh air, and see what’s going on around the barn. Dutch doors leading out to a paddock make it easy when you want your horse to have light and fresh air, but don’t want him to go out into the paddock – just open the top portion and leave the bottom closed. On cold nights or blustery days, close the upper half too and your horse will stay warm and dry. 3. STALL MATS and STALL MATTRESSES:With bad weather comes more time spent indoors foryour horse. Why not make him as c comfortable as possible by installing one of our stall mattresses or stall mats? Our StableComfort system is waterproof and encourages your horse to lie down more without getting hock sores. Our LokTuff matting provides comfort, traction and insulation against cold and wet. Both systems reduce bedding costs and stall cleaning time. 4.AUTO WATERERS: There’s an old saying, “you can lead a horse to water, but you can’t make him drink.” This is especially challenging during the winter months when water in buckets can freeze. Research shows that horses are more likely to drink water between 45-65 degrees Fahrenheit. This is especially true of older horses that are sometimes sensitive to cold water. Classic Equine Equipment offers the EQUIFount Horse Water with its optional EQUIFount Heat Tube. Easy access to fresh water for your horse, easy cleaning for you. 5. WASH BAY HEATERS - These wash bay heaters make it easy to keep your horse clean and dry even in the worst of weather. The NEW SOLAIRA ALPHA SERIES electric infrared heaters are perfect for drying your horse after a workout or bath. And it’s not just for horses – you can take advantage of the heat as well as this heating directs it’s heat to warm people, objects and things and not the air. 6. STORAGE SOLUTIONS – Winter horse care just seems to mean more “stuff.” Your horse’s blankets, sheets and coolers can take up a lot of room. And maybe you like to store an extra sweater or pair of gloves in case the weather changes. Many people add extra supplements to help keep weight on or to help control arthritis in the winter. 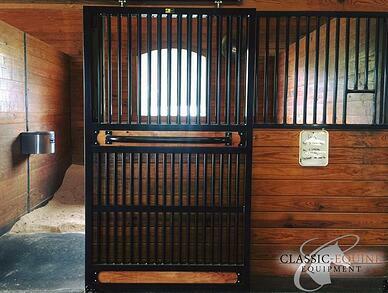 Classic Equine Equipment has several great storage solutions for tack and other horse necessities. Winter is a great time to get things organized. 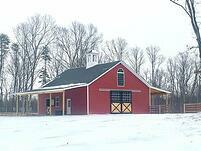 Let Classic Equine Equipment help you enjoy winter with more time and less work.